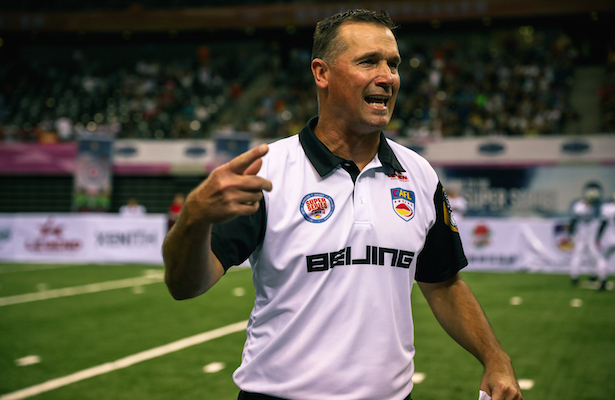 Clint Dolezel, the head coach of the Beijing Lions has put together a five game unbeaten streak and has his team poised to win the first ever China Bowl, emblematic of the title in the China Arena Football League. If you care to take a look back, his winning streak is a little longer. Dolezel is also the head coach of the Philadelphia Soul in the Arena Football League in the U.S.A. His last loss in that league was on June 17 to the Arizona Rattlers. From that date forward he has not lost a game. The Soul won its next seven games, avenging the loss to Arizona in the league championship game. Then it was on to China. With his five victories here the coach has won 12 straight games. With his second professional title within reach, just a little less than five months apart, I sat down with the coach to get his take on how he builds a winning team. MM: What does it take to put together a team that can go undefeated? MM: It looks like your team is having enjoying this run? How long does it take before it becomes fun? MM: Is there a point in a training camp or a season where you turn a corner and then you know you have something special? MM: You have only been together in China for about eight weeks so how are they getting along here? MM: So it’s been a great learning experience, but what have you learned? Dolezel and his Beijing Lions will meet the Qingdao Clipper on Sunday at 3pm in the China Bowl.